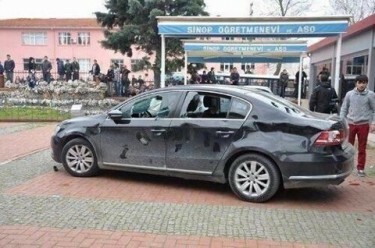 Two-thousand angry protesters attacked and attempted to lynch members of a Kurdish delegation visiting Sinop, a city in the Black Sea region of Northern Turkey. BDP's decision to visit the region, known for its nationalist and conservative population, was a first in the history of the Kurdish movement, since the party focuses on eastern regions and big cities which of a mixed demographic. At the end of 2012, the Turkish government started negotiations with the imprisoned leader of the PKK Abdullah Öcalan, for a solution to end the 30-year war between the Kurds and the government. At the center of these negotiations is a new constitution, that includes Kurdish identity and will not imprison Kurdish guerrillas who are fighting or have fought against the Turkish military. The delegations visit to Sinop was the first step in starting a dialogue with the larger Turkish population to garner their support for the Kurdish-government negotiations. 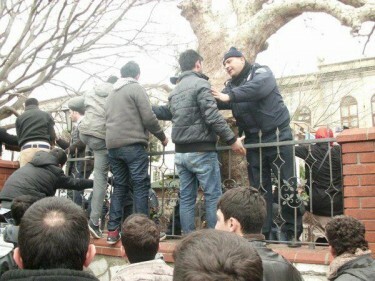 But when the delegation arrived, protesters threw stones and shouted angrily at BDP's member of parliament Sırrı Süreyya Önder. To escape the the attack the BDP and HDK members raced into a nearby teachers’ lodge. The angry protesters then surrounded the building, threw rocks inside and also destroyed the vehicles of the BDP members. Two protesters climbed on the roof of the building to hoist a Turkish flag and a put up a poster of Atatürk, the founder of the country. 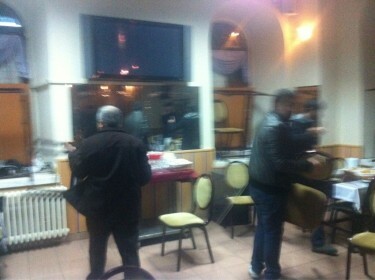 BDP members are trying to build a barricade on windows by using the tables and chairs. Picture is taken from Sirri Sureyya Onder's Twitter account. One of the destroyed cars of BDP members. Picture is taken from Twitter. A few hours later the protesters finally left the area, after policemen asked them, rather politely, to leave. Diyarbakır, a Kurdish city at the south-east of Turkey, hosted protests a few hours later against the lynch attempt. The police responded to these protests with tear gas and water hoses. Protests then spread to other cities, including İstanbul and the capital Ankara. Protesters left the area after policemen's polite requests of hours. Picture is taken from Ötekilerin Postası's Page. 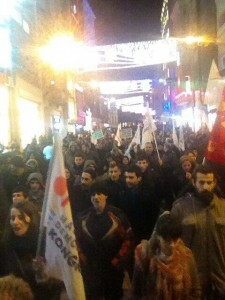 Protests in İstanbul against the lynch attempt. Picture is taken from Ertuğrul Kürkçü's twitter account.